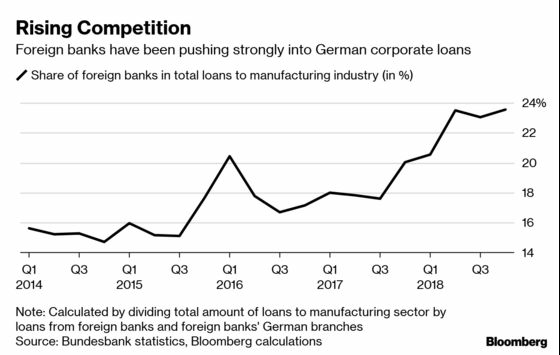 (Bloomberg) -- Germany’s beleaguered investment bankers could face even more competition when rivals move staff to the country after Brexit. While relocations from the U.K. will initially have little effect, that may change if banks then use their newly established presence in Germany to expand in the local market for investment banking services, Joachim Wuermeling, the head of banking supervision at the Bundesbank, said in an interview. “This is a dynamic business, and it may well be that when they wake up in the morning and look around them, they may see that they have further opportunities on the ground,” he said. “Frankfurt’s financial center will become more international and more competitive." Such a trend would mean more pain for firms like Deutsche Bank AG. 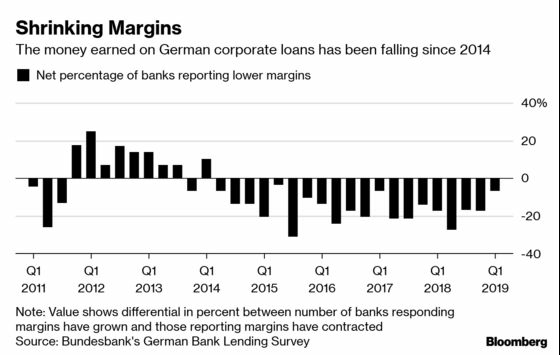 While Wuermeling didn’t name any banks, the Frankfurt-based firm is Europe’s biggest investment bank by revenue and has been losing market share to U.S. rivals. After a series of failed turnaround efforts, it is now studying a merger with a smaller German rival Commerzbank AG. Both companies have recently emphasized their German roots, but competition for corporate clients in their home market has eroded margins. Commerzbank this year cut its revenue outlook because of that, though new competitors keep entering. Dutch lender ING Groep NV announced in 2018 that it wants to increase its German corporate banking staff by 50 percent over the next three years. Wuermeling and other European banking supervisors have said they are neutral in assessing a potential merger of Deutsche Bank and Commerzbank. A deal between the two German banks could lead to the loss of as many as 30,000 positions, people familiar with the matter have said. Brexit-related relocations of bank jobs to Germany may help offset some of that. Wuermeling said he expects about 2,000 jobs to be moved to the country by 24 banks this year alone. Frankfurt’s finance lobby puts the number at as many as 2,500 jobs and estimates that the figure could rise to 10,000 in coming years. In addition to moving staff, banks are also shifting hundreds of billions of euros of balance sheet assets to Germany to prepare for Brexit. While the biggest chunk -- about 400 billion euros ($449 billion) -- will be moved by Deutsche Bank, JPMorgan Chase & Co. plans to shift about 200 billion euros, people familiar have said. That would turn it into one of Germany’s largest banks. So far, banks have sought to keep as much of their operations as possible in the U.K. to limit costs, but it’s possible they will eventually move euro-dominated business conducted for clients outside the European Union as well, said Wuermeling, who is also a member of the European Central Bank’s supervisory board. The Bundesbanker urged companies that rely on banking services to switch contracts with U.K. counterparties to entities based in the EU so that they can keep running. Failing to modify the contracts would mean banks aren’t able to provide loans and services as agreed.